A past that comes back to haunt a woman when she feels she has no future. A man with no mind of his own living a life of clichés. A teenage girl band that maybe never was. A dying millionaire’s bizarre tasks for the family hoping to get his money. A granddaughter losing the grandfather she loves. A list of things about Abraham Lincoln that reveal both sadness and ambition for a modern day schoolgirl. These stories and more make up this anthology from the winning and shortlisted writers in the 2016 Retreat West Short Story Prize and Flash Fiction Prize. From moving and poignant, to creepy and laugh out loud funny, these stories showcase the talented voices writing short fiction today. What a fabulous collection of short stories. I don't read a lot of short stories as sometimes I find that they feel incomplete; just when they start to get going the end appears all too suddenly. This collection has shown me another side to short story writing as clearly if the quality is there, a story can be both compact and complete. 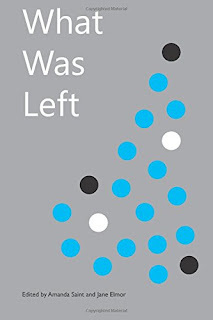 There are some amazing stories in this anthology; I was completely blown away by the first story, which is also the title of the anthology: What Was Left by Joanna Campbell. To start a collection with a story of this calibre had my heart racing in anticipation of what was to come next, as this story wasn't even the winner of the Retreat West competition! The variety is astounding, in contrast to this first poignant tale is the hilarious Honeysuckle Happiness Hospice by Ian Tucker that is simply a collection of email correspondence and the deserving winner that gave me goosebumps, On Crosby Beach by Judith Wilson. I could go on and write about some of the other stories, and I'm sorry to have only selected a few, but I think this is a collection from which everyone will pick a different favourite. I read the whole collection so fast that I wouldn't be surprised if I see something new and choose new favourites when I re-read it. From heart-achingly poignant to laugh out loud craziness and, with more variety than Heinz, there really is something for everyone in this cracking collection.